But Christmas Day was last Sunday? Surely Christmas is over, and we can start eating Hot Cross Buns for Easter now? Um. No. In fact, one of the stories from the Bible we usually tell at Christmas is from well after. But that's next week's song. This week. The highly historically, factually accurate story of another visitor to the manger. For some reason, Little Drummer Boy is my Dad's favourite Christmas song. It has been for so long I can no longer recall if my sister and I learnt to play it on piano and clarinet because it was his favourite, or if it is his favourite because we played it together. Little Drummer Boy is my favourite, because it gives my Dad such joy; and because it gives my sister and I joy to play it together, to play it for him. So for me, this song takes me to the heart of my family, and we're a close family, and I am far away. My hope is that I will be in Adelaide, and Deb and I will play Little Drummer Boy for Dad again, next Christmas. 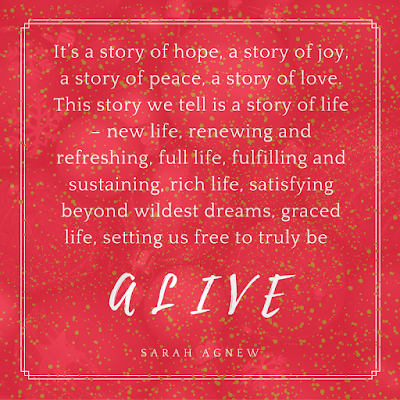 Merry Christmas to all in the sarah tells stories community. your soul with hope, your relationships with peace. My favourite Christmas song of all is Angels from the Realms of Glory (and its closely related sibling, Angels we have heard on high, which after hearing it in part above, I now give you in full). Enjoy! We play and sing Christmas carols throughout December, but perhaps we are meant to wait a little? Sing we now of Christmas is another favourite. It has a bright sound that brings angels to mind, that heavenly host surrounding the messenger above the field outside of Bethlehem with shepherds the chosen witnesses. Carol of the Bells has the same feel to it: pure joy, put to music. No wonder, then, that we want to sing and play these songs as early as we can, for as long as we can. Liturgically speaking, the season of Christmas does not actually start until Christmas Day (or perhaps with the watch night service on Christmas Eve). But with pageants, Christmas plays, dinners, services and parties, for community, school, work, Sunday school ... Christmas seems to start in December (or even November). Isn't that when Advent starts? Liturgically speaking, that's the first season of the Christian calendar: Advent. Waiting. On a Paris street, in a morning walk, they stop to talk to the camera: Papa, I am scared. Of what, my child? Of the angry people and their angry guns – what if they come back again? Then we will lay more flowers, my child, we will always have more flowers. In a home Down Under, on the way to slumber, they stop for a pressing question: Mum, what will happen when there is no more room? No more room for what, my child? What if – there is no more room for all the bodies, to put them when they need rest? Then we will dig deeper, my child, we will find a way to go deeper still. Quite possibly my favourite Christmas album of all is Celtic Christmas from Eden's Bridge. With some of the more popular carols in O Come Emmanuel and Silent Night come also less familiar (to me, at least) Coventry and Sussex Carols, How Brightly Shone the Moon and the confessional Christmas is with us again. 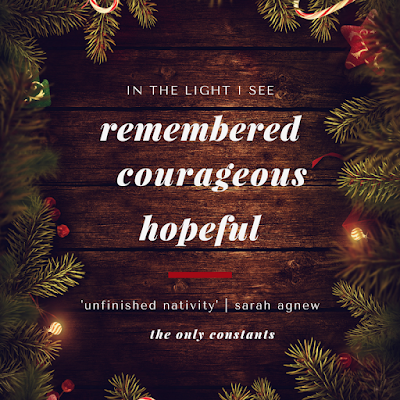 There are two songs for Mary – Breath of Heaven (made popular back in the day by Amy Grant), and Magnificat. What I love about songs for Mary at Christmas is the wondering into the gaps left by the biblical stories. 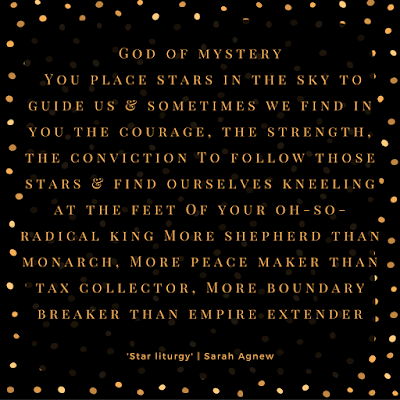 The pondering in her heart at the things the shepherds said, in Luke's version, becomes the wondering at what she knew in Mary did you know? The blessings of the generations takes on a profound nuance when sung generations later by spiritual descendants in blessing. Breath of heaven takes Mary's – how can this be, and here am I – and sings the hope and the trust in God whose gift she gladly receives with trembling. it is the darkest corner of the world, but we do not believe that darkness buries every light, so where we are we'll burn the wicks, stoke the fires, and turn our faces toward that dark corner, to see the shadows flickering in our flames, to see small light looking back at us; we will look, eyes open on our freedom incomplete while humans are not free; we will not turn away from what we cannot see, for we are braver in greater numbers; flash and sparkle in the sky, blaze and crackle on the beach; flicker, shimmer, quietly on the table – most of all, shine, shine, shine, and so unite our hearts with those who live inside the darkest corner of the world. honesty, integrity, faith and depth and pages full of heartfelt words. Christmas anticipation is an enchanting, honest, simple and often beautiful selection of creative pieces designed for use during the Christmas period. 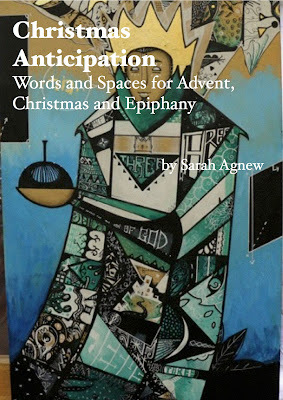 Featuring words from friend Cheryl Lawrie, and the stunning artwork of Grace Mitchell (as seen on the cover). Of course, there are many sides to this festive season. Christmas is not the only festival celebrated at this time of year. I love this fun nod to the breadth of the season from Glee characters singing for Hannukah. Since my tradition is Christian, I'll stick with Christmas: which can be blue, too. Another Glee song from the other side of Christmas, is River, singing missing a loved one. In many Christian communities, a 'Blue Christmas' service has become a new tradition in the Advent season. 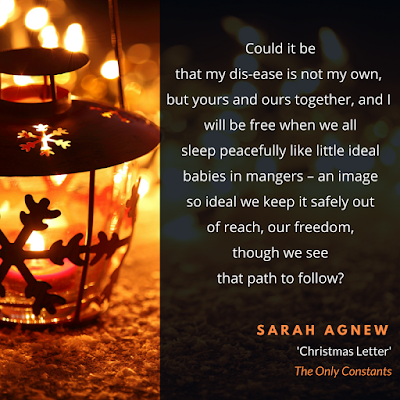 These gatherings are spaces in which to remember those who have died, who are far from us for any number of reasons, to hold in our hearts others who, to be held if we ourselves, are lonely, angry, ill, struggling in other ways.